Peter: Beth, thanks for talking with me today about your sculptures. I think a lot of people are curious about what goes into making one of your horses. Beth: The method I use is called the lost wax method. See, each sculpture starts out as a lump of wax. I buy sculpting wax in these huge 20 lb. blocks. I usually set the wax outside when it gets cold, then smash it on the concrete to make smaller and more manageable pieces. The pieces get thrown into a crockpot that mom donated to me, especially for this purpose, when I was 12 years old. P: So you've been doing this since you were twelve? B: Right, though most of my pieces didn't get beyond the wax stage back then. 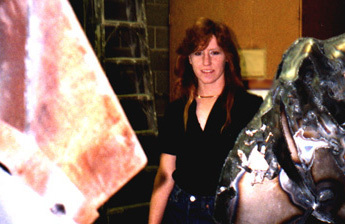 I started casting when I was in junior high, but I got most of my experience with bronze casting while I was getting my art degree at Colorado State University. P: OK, got it. So, back to the process. Once the wax is melted, then what? B: When the wax is melted, I turn off the crockpot until the wax is cool enough to handle, and I begin by taking a lump of it and molding into a rough shape. When I do a realistic horse, I get the basic horse shape in about six hours. It usually takes me around two weeks to refine the shape into the finished wax sculpture. Usually I create the realistic horse sculptures standing so I get the proportions right. Nothing bothers me more than when a horse is finished and looking beautiful, and then I step back and notice that one leg is too long! P: Understandable! So what happens after you've got the wax sculpture looking like you want it? B: A big bar of wax, called a sprue bar, is attached to the finished wax piece. The whole thing is then dipped in a sticky solution and covered with sand to create what is called a shell mold. After that, the whole thing is heated and this hardens the shell mold while simultaneously melting the wax, which runs out of the mold. P: Thus, the the name, "lost wax method." B: Right. The cavity inside the shell mold is what will be filled up with molten bronze. The tube left behind by the sprue bar is what will act as a funnel to allow bronze to be poured in. P: So the shell mold is ready at this point? B: Yes. The bronze is heated up to incredible temperatures, and it becomes a beautiful orange color with blue and pink swirls in it. It almost doesn't look quite real. P: The bronze is poured in, I assume, and when it cools you have your sculpture, right? How many copies can you make from one shell mold? B: First of all, the sculpture is closer to being completed, but there's still a lot of refinements to be done. And as for copies --- well, you have to chip away the sand mold to get the bronze out. They're not exactly reusable. P: What sort of refinements have to be done at this point, then? B: Detailing. Usually when the bronze comes out of its sand mold, a detail is missing, such as an ear, hoof, nose, leg or hip. Fortunately bronze can be welded and ground, and so I go to work smoothing out the imperfections and adding missing parts. P: What about the sprue bar part? Is that ground off as well? B: Yes, for that I use a Makita grinder. P: Weren't you telling me earlier about a calendar the Makita company makes? B: Oh yeah, they put out this cheesecake calendar every year, with girls wearing bathing suits and posing with the grinders and such. P: So you're saying that you don't wear a bathing suit when you are grinding off sprue bars? B: I'd love to, Pete, but I haven't been able to find one that goes with my goggles and dust mask. P: What about gloves? I notice your hands have some green on them. B: That's from the bronze. It sort of gets into your skin and doesn't wash off. I used to wear gloves but once I nearly lost a finger by getting a glove caught in the grinder. I get scuffed up now and again but skin grows back --- fingers don't. P: After it's cleaned up and detailed, then what? B: I put a patina on it, which gives the bronze depth and richness, and gives it a particular color, black, brown, white, green, as called for by the particular piece. For some patinas, I use a blow torch in the application process. Some patinas take as long as a week to complete. P: Well, I have to say that I never realized the amount of work that went into bronze sculpture. Beth, thanks for your time. Now, for more information on custom pieces, pictures of various pieces that are currently available, and ordering information, visitors to the web site can click on any of the links below.